Your Rock of Ages tour experience typically begins at our modern Visitors Center. 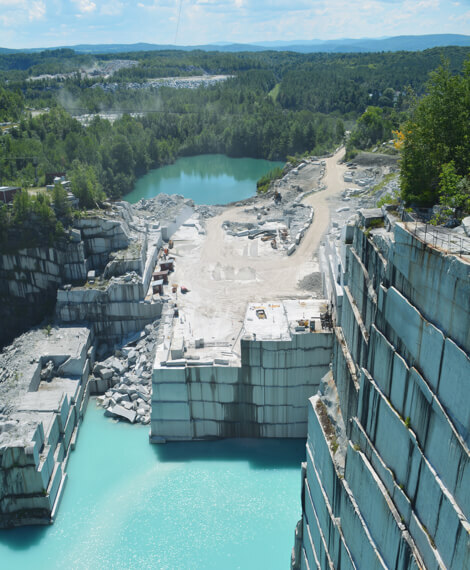 Here you may watch a video about the quarrying and manufacturing processes, browse the historic photos and exhibits, and shop for granite gifts and other Vermont specialty products. The guided quarry tour takes you to an overlook of the Smith Quarry. At nearly 600 feet deep, it is the largest operating deep-hole, dimension granite quarry in the world. The tour is approximately 40 minutes in length and typically runs rain or shine. Our tours depart at 10:30, 11:30, 12:40, 1:40, and 2:40 . Tours are first come, first served. Caravan options available, road not suitable for motorcycles. Please note that quarriers work Monday-Friday, 7-3:30, except for holidays and associated days, and therefore, there are no workers in the quarry for the tours on Saturdays. $6.00 per adult | $5.50 per senior (62+) | $3.00 per child (6-13) | Children under 6 are admitted for free. Experiencing a 160,000 square-foot factory from an observation deck is not to be missed. The factory is an exercise in contrasts, combining the new with the old. You can see artisans using hand tools in much the same way as Michelangelo did centuries ago. These little-changed, artistic endeavors are mingled with computer-guided, diamond-tipped saws and precision grinders. Developed as a prototype for use in commercial lanes, our granite bowling lane has delighted millions of visitors since 1958. Because a traditional bowling ball will eventually break when striking the hard granite lane, the concept never took off. That is why you will not see granite on the lanes of your hometown bowling alley. But the rubber balls we provide will offer you and your family a free, fun-filled experience during your Rock of Ages visit. A spectacular promotional video has been produced in Smith Quarry, showcasing the natural seams in the rock that run horizontally and the deep opaque turquoise water. The purity of Barre’s granite in contrast with the spectacular voice of an opera singer is just breathtaking.